Imagine you’re an archeologist and have entered an ancient Egyptian mummy’s burial chamber. What would you find? You would find a coffin like the one you see here. 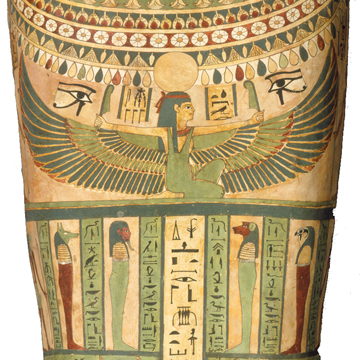 This coffin is in the form of a human body and is painted with the face and symbolic, funerary adornments of the person whose mummy at one time rested inside. Depending on the period in ancient Egyptian history and the wealth of the person, a mummy might have rested inside a set of coffins and these nesting coffins might also have rested inside a sarcophagus, carved of stone and decorated with a carved image of the mummy as well. 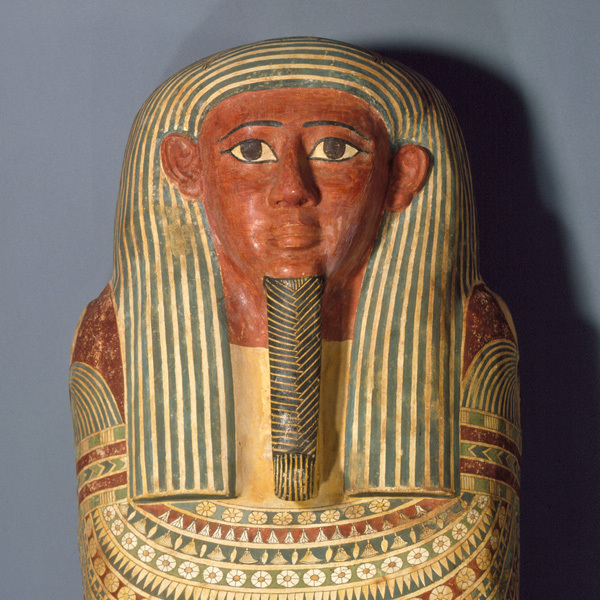 What if I told you this coffin once held a real ancient Egyptian mummy? Would you want to know his name? His name was Amunred. How can we be sure of his name? Do you see any form of writing on the coffin? The center columns contain ancient Egyptian writing. What are these symbols called? They are called hieroglyphs. Hieroglyphs on the back of the coffin spell out the name and title of Amunred. The hieroglyphs on the front spell out prayers and incantations from the Book of the Dead. The ancient Egyptians believed each and every person had a spirit or life force. They called this spirit the ka. They believed that after a person died, his ka would live on in an afterlife. To help Amunred cross over into what the ancient Egyptians believed was the afterlife, prayers and incantations from the Book of the Dead were painted on his coffin. Do you want to learn about the practice of mummification? The ancient Egyptians began the practice of mummification for the same reasons they decorated their coffins with their likenesses and placed statues in their tombs that resembled them in some fashion: so their soul would be able to recognize their body. In this way, the ancient Egyptians believed their soul would have a place to reside and receive new life for all eternity. Keep in mind, no two mummies were mummified alike in ancient Egypt. How a person’s body was mummified depended on the period in ancient Egyptian history and the wealth of a person. In general, though, workers emptied the major internal organs—liver, lungs, stomach, and intestines—from the body cavity through an incision in the left side. They left the heart in the body and often removed the brain through the nose and discarded it. The body was packed with a type of soda ash and salt to dry it out. After about forty-to-seventy days, the body was washed and covered with oils. The internal organs were treated too and wrapped in linen and put in special containers to be placed in the tomb or stuffed back into the body. The body was then stuffed with dry materials such as linen to make it look lifelike. Finally, the body was covered again with oils and wrapped in thin strips of linen. Sometimes, amulets (good luck charms) were inserted between the wrappings. Even though Amunred’s coffin is nearly three thousand years old, it has many clues that speak to us from the past. The clues tell us about the traditions and beliefs of the ancient Egyptians. A general, idealized likeness of Amunred is painted on his coffin. When a person’s face is idealized in art this means his or her face looks perfect and doesn’t have any flaws. Describe Amunred’s features. He has the reddish-brown skin typical of how men were portrayed in ancient Egyptian art. He is wearing a curly, divine beard and a divine wig, drawn as blue and white stripes stretching across his forehead and falling onto his shoulders. The braided beard with curly tip represents the false beard that Osiris wore. In ancient Egyptian belief, Osiris was a powerful ruler and god of the underworld. Wearing the false beard of Osiris was a sign of power. Most rulers in Egypt were men but one woman who ruled even wore a false beard. We know this, because there is a portrait of her wearing the false beard. In case you are wondering, the pharaoh would attach the false beard to his face with a strap. Why would he do this? In ancient Egyptian belief, Osiris was killed but soon afterward achieved immortality. By wearing the false beard of Osiris, the pharaoh believed that like Osiris he would be a powerful ruler and would live forever in the afterlife. Similarly, by having the false beard of Osiris painted on his coffin, Amunred believed he had guaranteed himself a place in the afterlife as well. “Osiris was a wise and mighty king. He civilized his people and taught them how to grow crops and how to breed animals. He gave them a code of laws to live by and showed them the proper ways in which to worship the gods. Egypt became a mighty land under his rule. Soon Osiris left to civilize other lands. Now it must be told that Osiris’ brother Seth was envious of Osiris. As soon as Osiris left, Seth began to scheme against the great king. He quickly came up with an evil plan. Secretly and with the help of his friends, Seth had a chest made that fit the measurements of Osiris’ body exactly. Upon Osiris’ return, he had a great feast to which he invited his evil friends and his brother. Osiris had a pure and innocent heart and suspected nothing. When the feasting was over, Seth had the finely decorated chest brought out. He offered it as a gift to anyone whom the chest fit. One by one, his evil friends tried to fit into the chest. Some were too short. Others were too tall. Some were too small. Others were too big. Lastly, it was Osiris’ turn. Osiris lay down inside suspecting nothing, and his body fit the measurements of the great chest exactly. Seth quickly slammed the lid down. Without a moment to lose, he nailed the lid shut and poured molten lead into the seam hoping to seal the chest forever. Then with the help of his friends, he threw the great chest into the Nile, and his heart heavy with sin, Seth left Osiris to die! The news of Osiris’s death reached Osiris’ wife Isis. Isis was beside herself with grief. She put on a dress of mourning and set out to find the chest that contained her dead husband. As it turned out, the chest had floated out to sea to the land of Byblos and had lodged in a tamarisk bush, which soon became a glorious tree. The king of Byblos greatly admired the tree. He had it cut down and made into a magnificent pillar to support the roof of his palace. News of this reached Isis. Isis traveled swiftly to the island of Byblos. She begged the king to take down the pillar and cut it open to release the great chest. The queen took pity on Isis. She convinced her husband, the king, to take down the pillar. The king’s servants took the pillar down and cut it open. There inside was the great chest! On the coffin we see the many gods who would protect Amunred in the afterlife. On each of Amunred’s shoulders is painted a sun disc atop the head of a falcon. In the middle is painted Nut, goddess of the sky who gives birth to the sun every morning. Osiris and Isis are Nut’s children, as are Seth and Nepthys. Nut spreads her wings in protection. What does she hold in each of her hands? She holds in each hand a feather of truth. What do the feathers represent? The ancient Egyptians believed that after a person died there was judgment in which one’s heart was weighed. They believed that before a person could enter Paradise, his or her heart had to be as light as a feather and not heavy with sin nor too light indicating laziness or it would be eaten by a beast that was part lion, part hippo, and part crocodile! What is painted beside each feather? The eye of Horus is painted beside each feather! The eye of Horus recalls the ancient battle between good and evil. As we read, Horus fights his uncle Seth to avenge his father’s death and to gain control of ancient Egypt, and he loses an eye. Horus recovers his eye and presents it to his father Osiris, thereby helping Osiris attain immortality. For the ancient Egyptians, the eye of Horus was an amulet (good luck charm). By painting the eye of Horus on their coffin, the ancient Egyptians believed they would be protected in the afterlife. Do we have good luck charms? Yes, we do. Sometimes we carry coins, four leaf clovers or rabbit’s feet for good luck. What other figures are painted on Amunred’s coffin? Beneath Nut are painted the four sons of Horus. They are associated with different parts of the mummified body (liver, lungs, stomach and intestines) and are represented by a human, baboon, jackal and falcon. Beneath them stand Isis and her sister Nepthys opening their wings. Beneath them are genies of the underworld. On the feet are two jackals, which represent the god of the burial, Anubis. Anubis is represented as a jackal, perhaps because jackals were often seen at cemeteries. Would you like to see the Coffin of Amunred in person? All you have to do is visit the North Carolina Museum of Art in Raleigh, North Carolina. The Coffin of Amunred is in the ancient Egyptian galleries at the museum. Or perhaps you would like a tour. Tours of the collection are given daily, except for Monday when the museum is closed to the public. If you prefer, you can contact the museum ahead of time and arrange for you and your friends to have a private tour. I’m sure a docent at the museum would be happy to show you and your friends the Coffin of Amunred and many other works of art. Whether you visit the museum on your own or have a tour with a docent, it will be well worth your time!